My husband took a picture of this illuminated water lily. It has been a while since I updated my website. I’ve been busy creating! Here are the latest paintings. The first watercolor was finished in the Spring, inspired by the rebirth of nature after a long winter. Before our trip to Alaska this summer, I painted the next painting from our trip to Scotland, a most beautiful place! We loved exploring Alaska and caught this bald eagle catching his meal. The last painting is from our helicopter ride over the Juneau glacier field. I am deathly afraid of heights, so I took many pictures to keep my mind off of how high we were! I hope you enjoy these watercolors as much as I did painting them! Here is my latest commission of a house in Florida. The couple moved up to New Jersey and wanted a remembrance of their time in down south. They loved it! I enjoy painting for people. Do you have a photograph you would like me to do in watercolors? Through our travels, I love to take photographs, which usually become paintings. The photo for this watercolor was taken in Edam, Holland (where they make the cheese). I saw these clogs, klompen or wooden shoes and loved the textures. Obviously, they had been hanging there a long time. Notice the difference in textures of the wood, from the white gutter support to the shoes to the house. It was a challenge to paint but I always love a challenge. The Dutch landscape was beautiful, there is a future windmill painting on my list! My dear mentor and friend, Sandy Saler and her husband Rich framed this for me with re-purposed weathered fencing. It looks beautiful in the perfect frame. 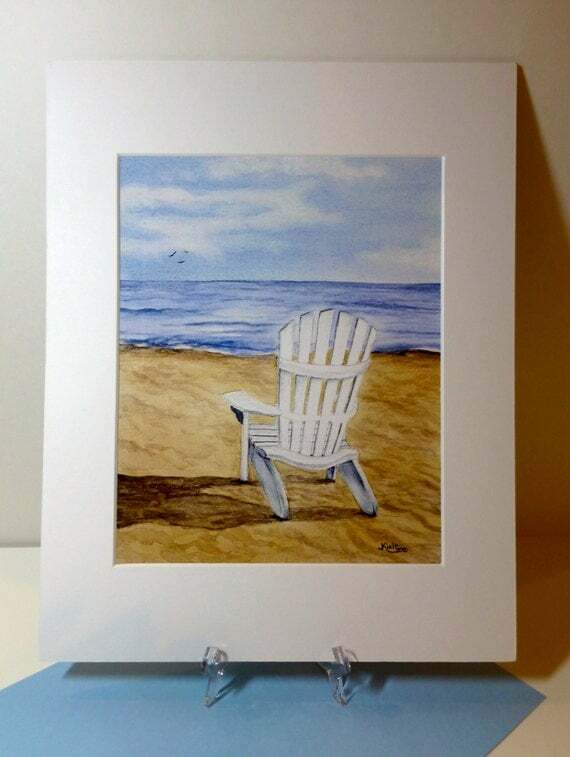 This matted high quality print is from my watercolor painting of a beach scene. This is a perfect gift for a beach house! The matted print fits in a standard 11″ by 14″ frame. The matte is white with a sturdy backing and will be wrapped in plastic for protection.